Wooden shops and kiosks are a great decision for your business. Such building will decorate any landscape and will attract many customers. 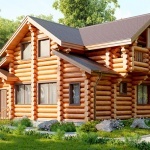 Wood itself is a nice building material which doesn’t need any interior set up. If you choose the regularized round timber or laminated veneer lumber as building material you will make a good decision which saves you much money. Many people have already highly appreciated the advantages of the wooden houses over the ones which are built of other materials. 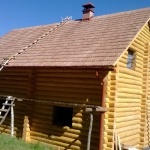 The building of the given constructions and also the building of the wooden churches is one of our fields of work. While building the house we use the materials of our own production: regularized round log, laminated veneer lumber, wild log. The walls of the shop or kiosk are of the natural materials. They hold the right humidity and the temperature in the room. Even in condition of opened windows the air inside is refreshed. It is always warm in Winter and there is the light coolness in Summer. The log of the wooden constructions became very popular nowadays. 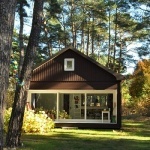 People from abroad have evaluated their practicality and environmentally friendliness. Their advantages are vivid. Wooden constructions provide right humidity and low thermal conductivity. Such constructions are very stable and durable. 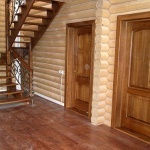 our company has been working with projects and building of the wooden houses over ten years. Our company showed itself as a reliable partner. the team which works for you is a qualified staff with rich work experience. we have our own manufacture in the Transkarpathian region. we don’t have any problems while adjusting the construction. It is held quickly and in a high quality. The construction doesn’t need any additional winterization or finishing. we pay a great attention to the right treatment of the materials and their storage. 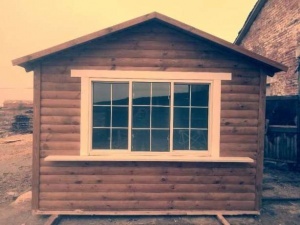 If you rely us the building of the new shop you will get a great exclusive building!